2-stage adjustable match trigger...and the trigger blade is metal! Hundreds of PCP guns have come and gone, but one name remains nearly immortal in this rapidly changing industry: the Benjamin Marauder. Creating PCP fans worldwide with their groundbreaking platform, Benjamin refused to remain complacent about the Marauder’s place in airgun history. 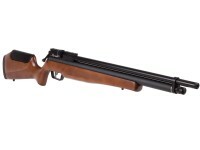 Their answer to the continued demand for this popular rifle? 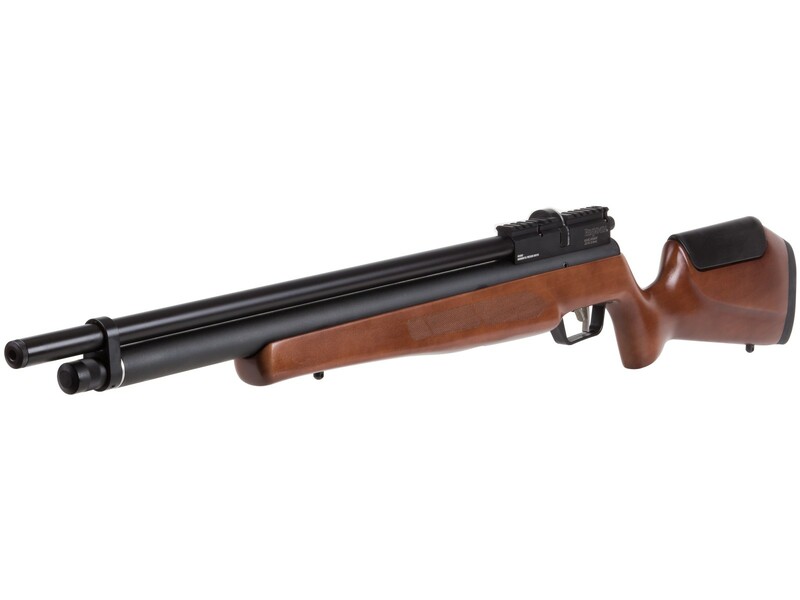 The Marauder Field and Target, the first fully-regulated Marauder, an airgun that gives shooters everything they loved about the Marauder with more shots than ever before. Using an all-new regulated system, the Field and Target delivers 80+ shots in both .177 caliber and .22 cal—more than double the shot strings of the original Marauder. These shots hit speeds up to 1,000 fps in .177 and 850fps in .22. 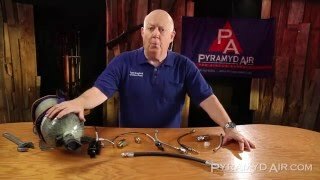 Its 3000 psi tank incorporates a quick-disconnect so you'll never have a problem finding a way to fill your gun. Load up the cylinder and your 10rd rotary mag, and blast away at targets with the precision of a field target rifle. The Field and Target keeps the excellent 2-stage adjustable metal trigger of the original Marauder. 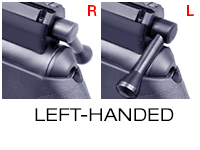 Cosmetically little has changed, but there are some very important and exciting differences, mainly the addition of a Weaver/Picatinny optics rail instead of the old variant’s 11mm Dovetail for more choices in optics. 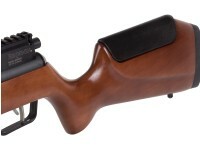 The craftsmanship that went into this gun resulted in a rifle that shoots as good as it looks. 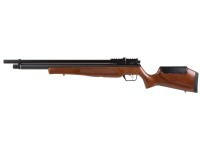 The checkered stock with adjustable comb has all the quality you'd normally see in a high-end European airgun without a premium price, all while honoring the traditional original hardwood design. With a balance of historic Marauder quality, regulated power and timeless accuracy, the Marauder Field and Target Edition delivers a premium shooting experience and is the definitive version of the Marauder to date. 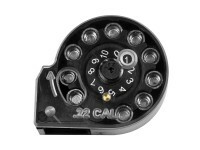 Things I liked: Just inboxed my .22 cal last night and installed scope. No adjustments from factory , str8 out of the box with LW barrel sighted in at 30 yards being about to cover ever shot with a dime with 3 different pellets. Could cover a 10 shot group at 50 yards with a quarter. I musta got lucky and got dandy Absolutely amazing shooter. Things I liked: I grew up with a Benjamin pellet rifle model 342 and pistol model 132. First thing after a school day was to grab a Benjamin and head to the woods. I still own them and they still have that made in U.S.A. wallop. It was time to finally go PCP! I really am pleased to add the Field & Target Marauder to the family. Even though after joining forces with Crossman years ago, it's definitely still a Benjamin. 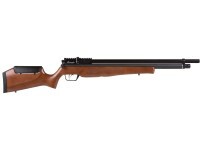 Thank you Pyramyd Air for a quality air rifle the way I remember they should be. Things I would have changed: Not likely. What others should know: Getcha one! Things I would have changed: Knock some weight off of it if it wouldn't hurt the accuracy of the rifle. What others should know: This thing is Awesome. I had the scope for this mounted by Pyramyd Air and I think the scope must have gotten knocked around a bit in shipping because the first 20 shots I took with this gun were 3"-4" high a 200' and no amount of adjustment was helping. After I centered the scope and reattached it I only had to make a couple of small clicks on the scope and this gun is spot on a 200'. At 200' I'm putting 10 shots in a 1/2" group on an outdoor range with .177. I could easily get more than 60 shots before having to refill but I've been refilling the gun and the magazines at the same time. I may pick up a couple more magazines. I also like the fact that this is a very quiet gun to shoot; the pellet hitting a cardboard target at 200' away makes about the same amount of noise as the gun. This is a heavy gun though it actually weighs slightly more than my Remington 870 loaded with eight shots. 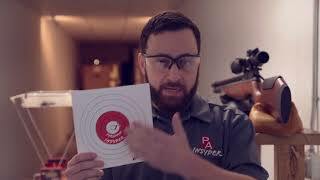 I'm doing 1/2" groups at 200' off the bench, a friend of mine has the same gun and he takes the heads off matches prone at the same distance. Accurate, quiet and quick follow-up, the three things I wanted and this gun deliveries on all three points. 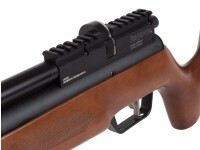 Just wondering when the .22 cal w/ Lothar Walther barrel will be available? I saw the estimated in-stock date keep changing, from 12/19 to 12/26 and now is 12/28? That is the last date provided to PA by Crosman, so hopefully it holds up for you. Are the barrel on this model the same as on the ordinary Marauder?